Lapis inlaid sterling silver bracelet, designed by Navajo Calvin Begay. Horseshoe design. 7 inches long when closed. Item#2504. 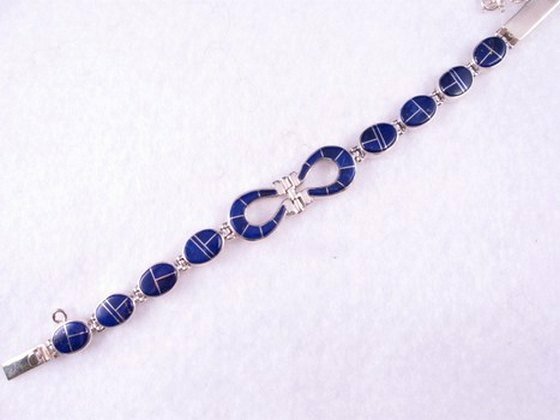 This gorgeous contemporary lapis inlaid sterling silver link braclet was designed by well-known Navajo jeweler, Calvin Begay. The bracelet is absolutely breathtaking is both design, artistry and craftsmanship. 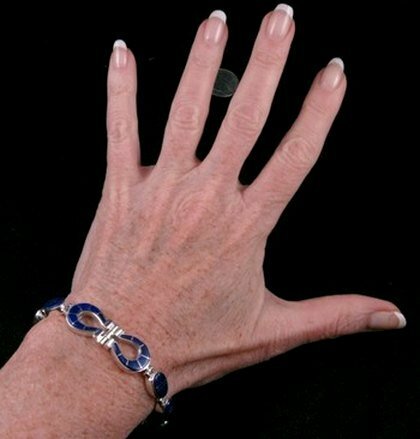 The link style sterling silver bracelet measures 1/2 inch wide at the front. It is 7 inches long when closed. My wrist is 6 inches around and the bracelet is somewhat loos on me. Safety chain to prevent the bracelet from falling off, if the clasp is accidentally opened. Brand new and in perfect condition. Gift Box and Certificate of Authenticity included. Hallmarked Calvin Begay and Sterling. Calvin Begay is an award winning Navajo artist, jeweler, designer and master craftsman. As his fame has spread, he has moved into an atelier system. He designs an item and turns the execution over to his apprentices and colleagues, under his supervision. (For those unfamiliar with it, the atelier system is what allows great artists like Calvin to turn out more work than their individual hands could ever accomplish.) This bracelet was designed by Calvin but made by one of his apprentices.